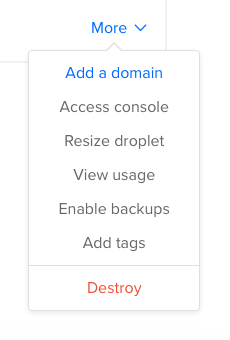 Now we’re off the command line for a little bit, let’s head back on over to your Droplets page at DigitalOcean. You should see your Droplet listed, on the right hand side of it click More and then Add a domain. Enter your domain name (testwordpress.com) into the textbox and click Add domain. That’s it! If you’re interested in more information, look no further. We then need to change our DNS records (for our domain name) to point to our new Droplet. There are hundreds of tutorials online for this and its not DigitalOcean specific, so it seems crazy to write another. This tutorial is thorough and tells you everything you need to know. DNS records can take time to propagate, how long it takes depends on your TTL and your provider, but 24 hours is usually more than ample time for the changeover to complete. Once this is complete you should delete the record we created in your host file. We no longer need it. Most websites need the ability to send emails. Some also need to receive so need to host a mailbox – the latter is out of the scope of this tutorial, and you may want to consider this before you do it. Enabling the server to send emails however is quiet painless with an application called Postfix. Then install mailutils, which will launch the wizard to configure it, run the following command and follow its instructions. When the question comes up to set your mail type, select Internet site. echo "This is the body of the email" | mail -s "This is the subject line" "[email protected]"
And that should be it! You server should now be able to send emails. If you’d like to understand what is going on, or read more, here is a great start. By this point you should have a Droplet that is successfully running WordPress, can be viewed online and can send emails. I hope this tutorial proves useful to anybody that was looking to set up a Droplet to run WordPress, or any PHP application for that matter. If you have any questions, notice any errors or feel something needs to be elaborated on please feel free to leave a comment below and I’ll do my best to update the posts.